There’s nothing new about feminist rhetoric on college campuses. For decades, women at institutions of higher learning have come together to empower themselves and each other. Likewise, there’s nothing new about feminism online. Countless sites are devoted to advancing equality between genders. Now, a new stage has emerged at the intersection of these two communities. Nicole VanAller ’17 is studying feminist identify among millennials as part of a Summer Scholars project. 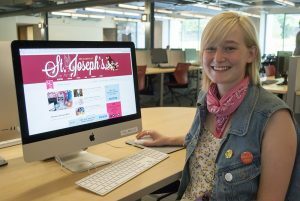 Specifically, she is researching the online magazine Her Campus, an online magazine specifically aimed at collegiettes, a term the website created and trademarked to describe “ambitious, savvy and aspirational” college women. VanAller, who is working under the mentorship of Jenny Spinner, Ph.D., associate professor of English, likes that the Summer Scholars program allows her to work on a longer project than she could during the semester. Once the project is finished, VanAller hopes that she can expand her research on millennial feminist identify. “I hope to learn what drives gender construction in our generation, especially in business,” she says. VanAller is a student in SJU’s Honors Program and has earned a place on the Dean’s List in every semester since she arrived at SJU. She was recently inducted into Phi Betta Kappa and is a member of the Sigma Tau Delta English Honors Society. Outside the classroom, she is the marketing and communications director for the SJU Women’s Leadership Initiative and founder of the SJU Independent Press, a zine that gathers student writing surrounding a single topic.